We spent a few nights in the town of Huế on the central coast of Vietnam. I immediately liked this city the moment we landed. It was vibrant, it was clean and very friendly! Honestly, we could not walk down the street without every other person calling out "Hello!" or stopping to chat. Babies would wave, children would smile, the elderly would nods their heads in our direction. I swear, even the stray dogs grinned at us. I couldn't get over it. Huế was decimated during the Vietnam War. Most of its population was wiped out, buildings were obliterated and the scant remaining citizens were left homeless. What the citizens of Huế have rebuilt in the past 50 years is nothing short of heroic. And they continue to rebuild their city to this very day. I have never seen so many wheelbarrows and buckets of concrete in my life! Slowly but surely the people are returning their beloved city to its former glory. Shortly after we arrived, we learned that Vietnam's U23 soccer team was playing in the semi-final match against Qatar. We watched the game in a local bar and witnessed the celebration when Vietnam won. The streets were immediately PACKED with people and honking motorbikes. The party carried on until the very wee hours of the morning. One morning, Joe and I were walking across a bridge when we came upon what seemed to be an accident. I wondered if the elderly gentleman had been hurt. Nope! He was just taking a smoke break in the middle of the bridge deck. The traffic swerved around him. As soon as he finished his cigarette, he hopped back on his pedi-cab and cycled away carrying three bamboo beds. This is why I love Vietnam. We bought some incense from this woman. She invited Joe to sit in her chair to try his hand at making it. "No! No! No!" she yelled as she watched him mangle a stick of incense. Then she good-naturedly pushed him out of her seat. 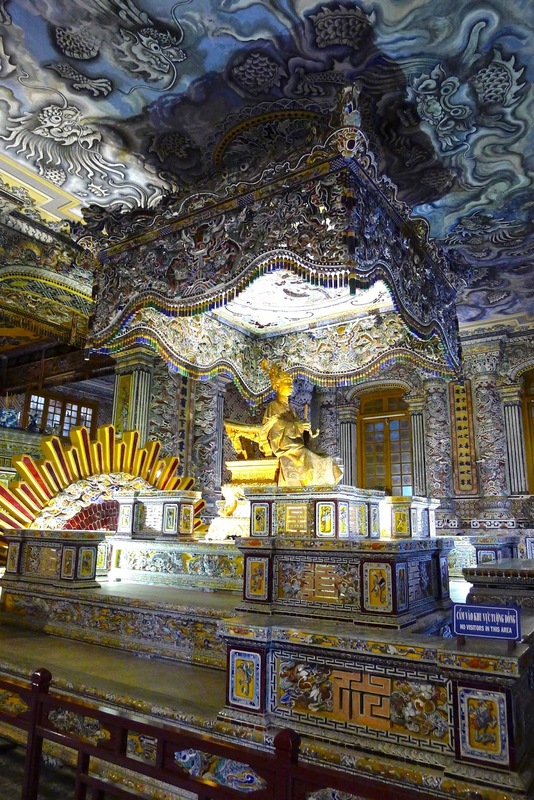 Several emperor's tombs surround the city of Huế. We hired a driver to take us to see them. The tombs were set in serene parks, very quiet and peaceful. I stopped at a hair salon on one of our walks around Huế . Without exchanging a word, the hair dresser lopped off my mop with a razor in about 10 minutes. As you know, Joe is fascinated by street food. One afternoon he saw this woman set down her portable restaurant from a pole on her shoulders. She was selling home-made yogurt. Of course Joe bought a bowl from her. After three days, we headed further south. Our next stop was Hoi An. We hired a taxi to drive us three hours to the city of Hoi An. As we drove higher and higher into the Annamite Mountain Range, we entered into the Hai Van Pass. At its crest were bullet-riddled American bunkers, remnants from the Vietnam war. Hoi An is a beautiful city. It, too, is filled with fun and friendly locals. Its 'Ancient Town' is incredibly old and interesting. We wandered its streets for hours on end. I wish we had stayed longer in this lovely city. 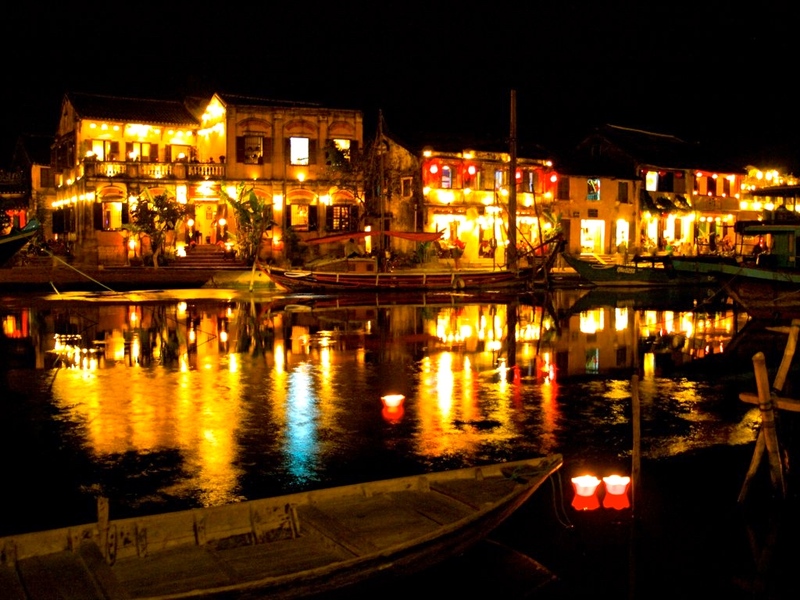 Hoi An's Ancient Town is a well-preserved example of a South-East Asian trading port dating back to the 1400s. Its buildings and streets reflect the all influences (both Vietnamese and foreign) that have combined to create this UNESCO heritage site. One morning we took a 'Food of Hoi An' walking tour. We were with a guide and eight other like-minded people and ate for 4 solid hours all around the city. On the food tour we learned that crumpled napkins on the floor signalled a good place to eat. The number of napkins showed how many people had eaten there before you. If there were lots of napkins, your food was sure to be fresh. The napkins on the floor also told you that the owner had been too busy cooking to stop and sweep. What a happy surprise to meet up with my friend Liz for a quick visit! Liz and I taught together for many years at Mamquam Elementary. She and her husband were on a cruise and decided to go for a day trip to Hoi An from their ship's port-of-call. She sent me a message for Joe and I to meet them. So much fun! 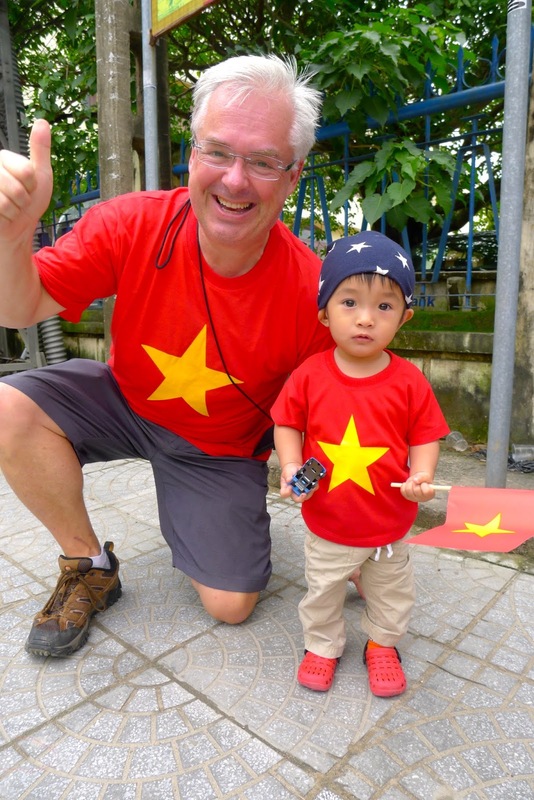 We were lucky enough to be in Hoi An on the day of the U23 soccer finals against Uzbekistan. Everyone was dressed for the occasion! Emotions were running high hours before the match even began. We watched the soccer game on a TV set up on the sidewalk in a vegetable market. Sadly, after playing in overtime on a snowy field in China, Vietnam lost the game to Uzbekistan. Did this stop the Vietnamese from celebrating? Hell, no! Parades of motorcycles with cheering passengers waving Vietnamese flags roared up and down the streets all night. Vietnamese women. Some of the hardest working people I've ever met. One night we returned to our hotel to find tables and chairs spilling out onto the sidewalk. The staff was celebrating the first anniversary of their hotel. They kindly invited us to join them. It was two hours of 'cheers-ing' in Vietnamese and eating. Hoi An is also a bustling trading town where dressmakers and tailors turn out custom-made garments overnight. These fine women sewed Joe a blazer, two shirts and me a dress. All in two days! I admire Vietnamese women. They are fierce. They are funny. 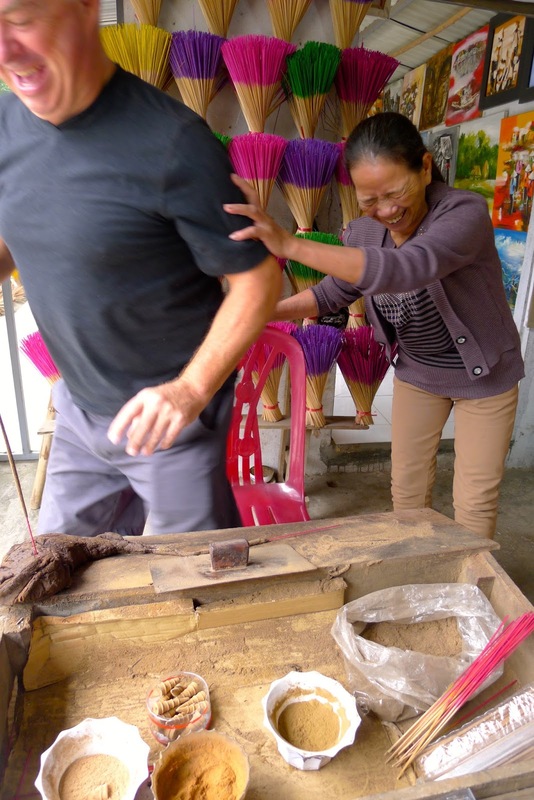 This woman came up to me on the streets of Hoi An. She placed her hands on my cheeks and asked, "Why you let your face be so hairy?" That question made me double over in laughter. I have been called 'Peachy' all of my life. And for good reason. After negotiating a price, she led me to the market where she began to thread my mutton-chops. She said, "I will remove the hair from your lip and chin for another 50,000 dong." "My upper lip and chin are that hairy?" "Oh my God! You have thousands!" More laughter from me. I adore these women. Boats being prepared to take people out for an evening float on the Haoi River canal. Lanterns are everywhere in this beautiful city. Every evening people light lanterns and set them afloat on the Hoai River canal while others row by in traditional wooden boats. Visiting these two coastal towns was a perfect reprieve from the noisy chaos of Hanoi. As always, it's the people I remember best. 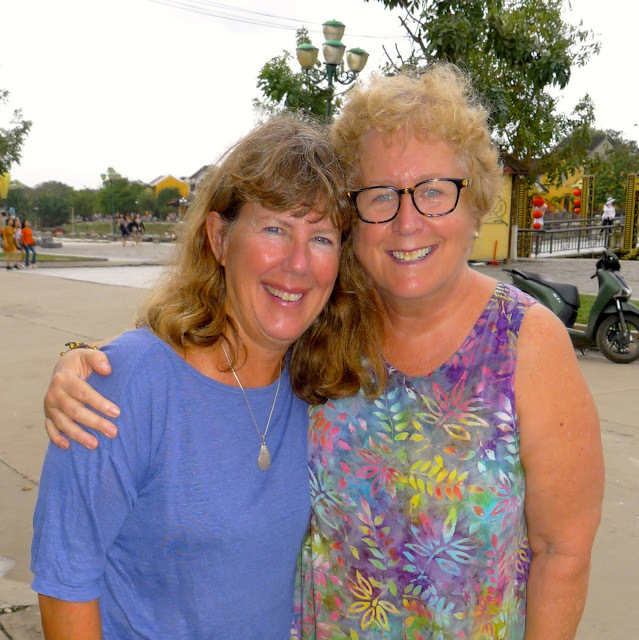 I will never forget the smiling faces and happy hearts that welcomed us to Huế and Hoi An. Now we're off to Da Lat!